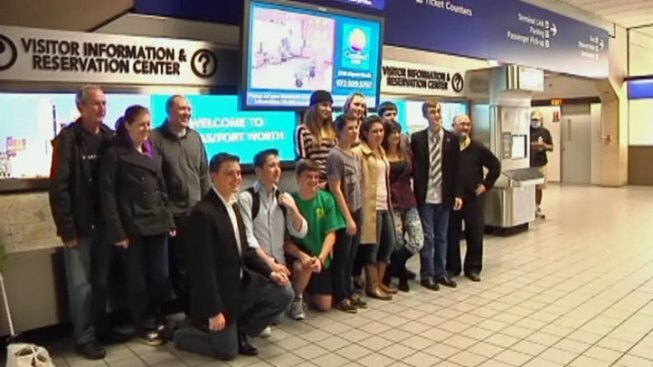 A group of high school students that was stranded in New York City because of Hurricane Sandy was back in North Texas on Friday. The 13 Bishop Lynch High School students, two coaches and an adviser were in the city Oct. 25 for a national mock trial competition. They were supposed to return to Dallas on Monday night, but flood waters submerged LaGuardia Airport's taxiways and runways. "We were very worried, but knew that they were in good hands," parent Joy Miller said. The group stayed at a Times Square hotel that had electricity and Internet access. The students were able to attend classes and stay in touch with parents via Skype. "Once we realized that the storm had gone through, things were a lot better," said David Post, one of the coaches. Now that they're back, the students are reflecting on the storm that left behind sheer devastation. "Most of all, our thoughts and prayers go to those who actually did get hit very severely by the storm, " student Erin Brown said.